with Prices for Seapost covers and cards. This book is an absolutely essential complement to ARNO GOTTSPEN’S work of 1988 and indispensable for anyone concerned with the Seapost of the West Africa lines. I remember the moment when I was for the first time leafing through ARNO GOTTSPEN’S long awaited book. I was rather baffled. I was looking for timetables and journey dates, for information regarding the usage of postmarks on certain routes in order to ascertain where the ship had been at the time when the postmark was affixed. Instead I found detailed descriptions of all the seapost items known to the author as well as an Operations Index for the line. In spite of the enormous industry which had gone into the work and much useful information from the archives of the Hamburg Head Post Office, the historical kernel of the matter was lacking. That which one would have wished to find in GOTTSPEN’S book is now available in CZIMMEK’S. 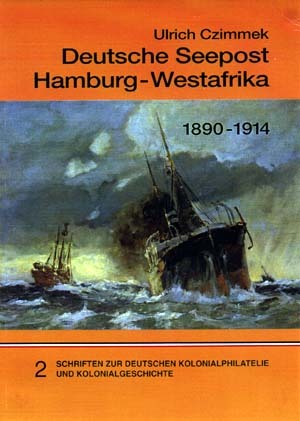 His book collates on 140 pages the timetables of all Woermann Lines on the West African routes for the years 1890 - 1914. Worked into this information are the actual journey dates so far as these were ascertainable from the ’Deutsches Kolonialblatt’. Most importantly the author has made the effort to relate each steamer voyage from1894 to the relative cancel, a Herculean labour which deserves our greatest admiration. Special mention should finally be made of the corrections to GOTTSPEN’S postmark usage data and the systematic pricing of all items, separately for each territory.